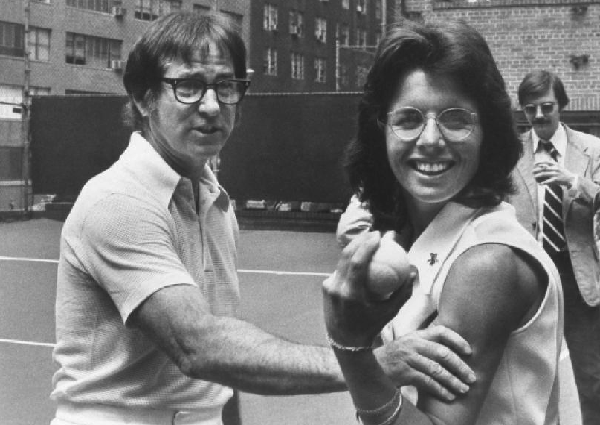 The 1973 tennis match between Billie Jean King and Bobby Riggs, billed as “Battle of the Sexes,” is apparently the hottest sports movie property in Hollywood. Just over a month after HBO announced it was making a film about the match — with Paul Giamatti starring as Riggs and Elizabeth Banks portraying King — Fox Searchlight has a competing project in development, with plans to begin filming this fall for a 2016 release. As reported by Deadline, the big-screen version of the story will be titled Battle of the Sexes, with Emma Stone cast as King and Steve Carell playing Riggs. Jonathan Dayton and Valerie Faris, who previously made Little Miss Sunshine and Ruby Sparks for Fox Searchlight, will direct the film. Interestingly, HBO is also making a tennis mockumentary starring Andy Samberg and Kit Harrington. That film is titled 7 Days in Hell and follows a marathon match at Wimbledon in 2004. Somebody at HBO likes tennis. “Battle of the Sexes” took place in 1973 at the Houston Astrodome, drawing national attention. King, who was 29 at the time and ranked No. 2 in the world, originally turned down a challenge from the 55-year-old Riggs. After playing top-ranked Margaret Court instead, and defeating her decisively, Riggs was emboldened to challenge King yet again. This time, he raised the stakes by getting promoters to arrange a nationally televised match with a $100,000, winner-take-all prize. King eventually accepted Riggs’ offer and the match was played in front of 30,000 spectators at the Astrodome, with an estimated 50 million viewers throughout 37 countries watching on television. She studied Riggs’ match against Court, preparing for how he would likely play against her. King ended up winning the match in three sets. As if two competing projects about “Battle of the Sexes” weren’t enough, a third movie about the event is also in development. Match Maker is based on a 2013 ESPN the Magazine long-form feature by Don Van Natta, which investigated allegations that Riggs intentionally lost the match to King so he could settle his massive debts to the mafia. This film is being developed by Will Ferrell and Adam McKay’s Gary Sanchez Productions, with Ferrell attached to play Riggs and Steve Conrad (Unfinished Business) writing the script.